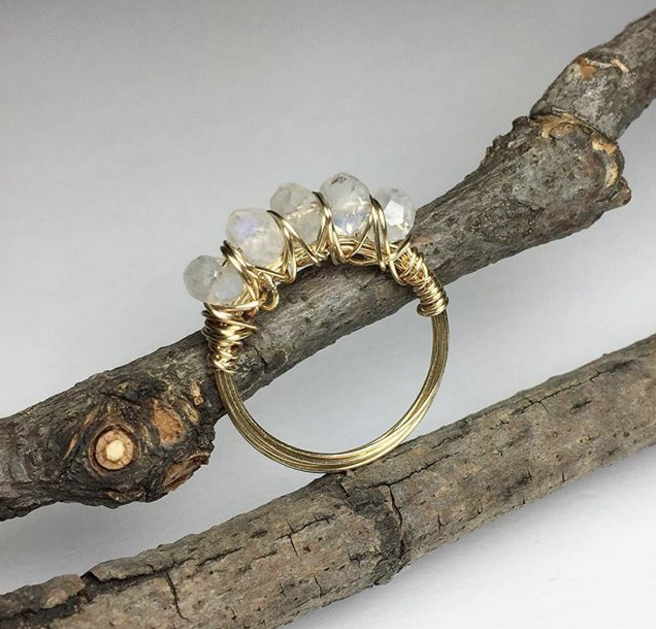 This video shows you how to wire wrap 5 rondel moonstone beads onto a size 5 ring using 30” of round gold filled wire. For a bigger size ring, thicker base, or thinner wire, be sure to have appropriately longer wire. First find something that is 2 sizes bigger than the size of the ring you intend to make, this will be your guide for wrapping. It could be a doweling, a ring sizer, or a marker. Remember as you build up more wire around the stones, the size of ring becomes smaller. For this project the length of wire was cut after determining the ring would have 5 strands of wire. Leave yourself aprox 4 inches of wire on one end and begin to wrap wire around the dowel, do this 5 times. Slip the wires off the dowel while holding them secure to retain their ring shape. Now you want to wrap the 4 inches of loose wire around the coils, moving towards the centre of the ring, you’re now forming the base of the ring. Make sure the wire is wrapped tightly around the coils. Using the other end of wire, thread on the beads. Leave a small amount of space between each bead and, with the help of pliers, wrap around the coil of wires. Wrap back towards the centre of the ring, and around each bead once as you make your way to the other side. Trim off the excess from the 4 inches of wire on the other side and tuck it in. Wrap the long wire over this making sure it’s smooth and won’t poke out. Wrap the long wire in reverse, and back around each bead as you proceed to the other end. Wrap several times around the ring and proceed to the other end, repeating this several times as desired or as the length of wire allows, ensuring that you end off wrapping the base in such a way that right and left are balanced and you can tuck the end wire into the coiled base of the ring securely, ensuring that it will not poke out later. This entry was posted in Wire Work, Jewellery Making Tutorials, Jewellery Making Techniques and tagged making a wire ring, wire rings.